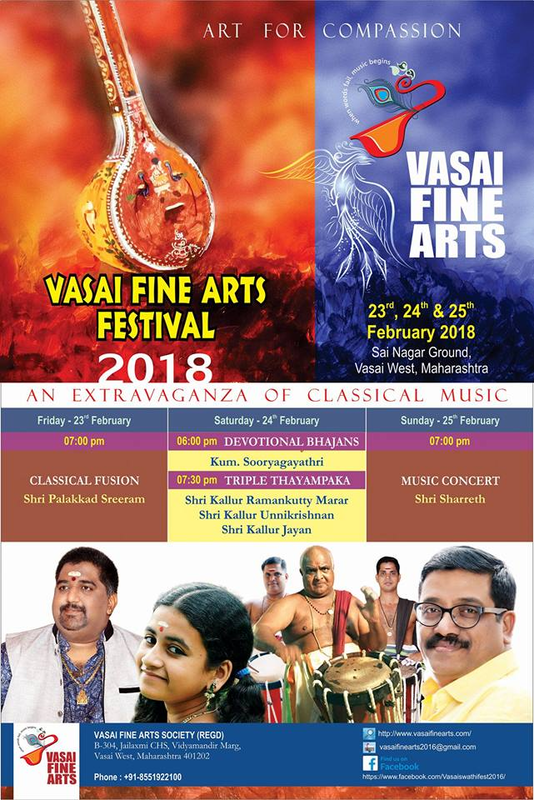 The Vasai Fine Arts Festival for this year 2018, under the leadership of Vasai Fine Arts Society will be held at Sai Nagar Ground, Vasai West, on Friday 23rd, Saturday 24th, and Sunday 25th February 2018. 1st day Friday 23rd Feb will witness, commencing at 6. 30pm, musical programme comprising "ClASSICSL MUSICAL FUSION" led by Sri Palakkad Sriram. Commencing at 6.00pm, musical programme comprising "Classical Bhajan" led by Miss Sooryagayatri, who has already drawn worldwide attention and won millions of hearts. 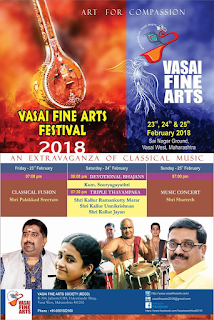 Commencing at 8.00pm, "TRIPLE THAYAMBAKA" led by Kalur Ramankutty, Kalur Unnikrishnan, and Kalur Jayan. 3rd day Sunday 25th Feb will witness, commencing at 6.00pm, "CLASSICAL MUSIC CONCERT" led by Sri Sarath, noted film music director. All are welcome to make the above events a grand success.